Is there anything better than sweet, juicy peaches? To me peaches just scream summertime and slow, lazy, warm days. 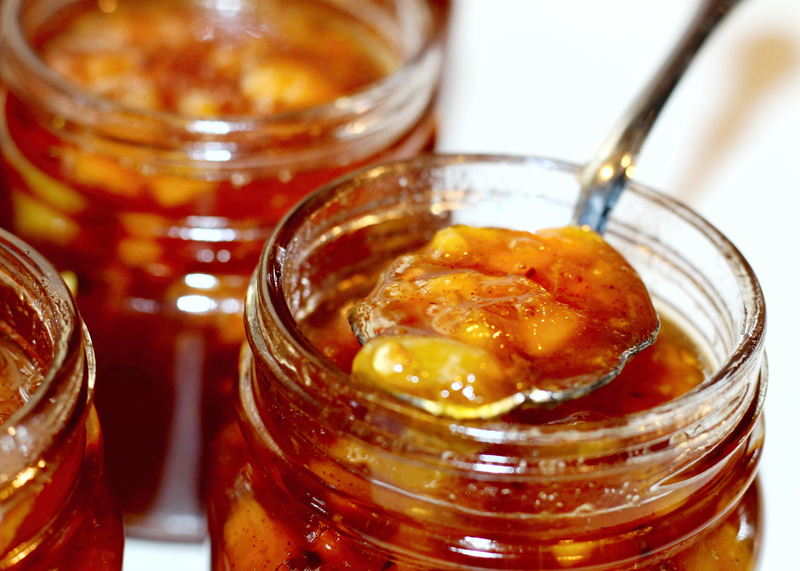 I recently purchased a basket of delicious freestone peaches from one of my farm friends at the farmers market, and just knew I wanted to create a unique and different jam with them. Smoky Honey Habanero Peach Jam is just that ... smoky, sultry, spicy, sweet ... you taste all the flavors with a slow, mild heat finish, and it is so good. Pair this on a cheeseboard with a variety of cheeses, or top on cream cheese over crackers. Baste it on a grilled or roasted pork loin,or brush over grilled chicken or shrimp. Delicious! Peel, pit, slice and dice peaches to equal 10 cups. Put the peaches in a large stock pot with the lime or lemon juice, honey, cinnamon, cloves, smoky honey habanero spice rub, or habanero peppers, red pepper flakes and butter. Stir in pectin and butter; heat over high heat stirring often (use a long handled spoon and be careful as jam will splatter some) until mixture comes to a boil. Add sugar all at once and return to a rolling boil (one that doesn't stop when stirring) and boil hard one minute. 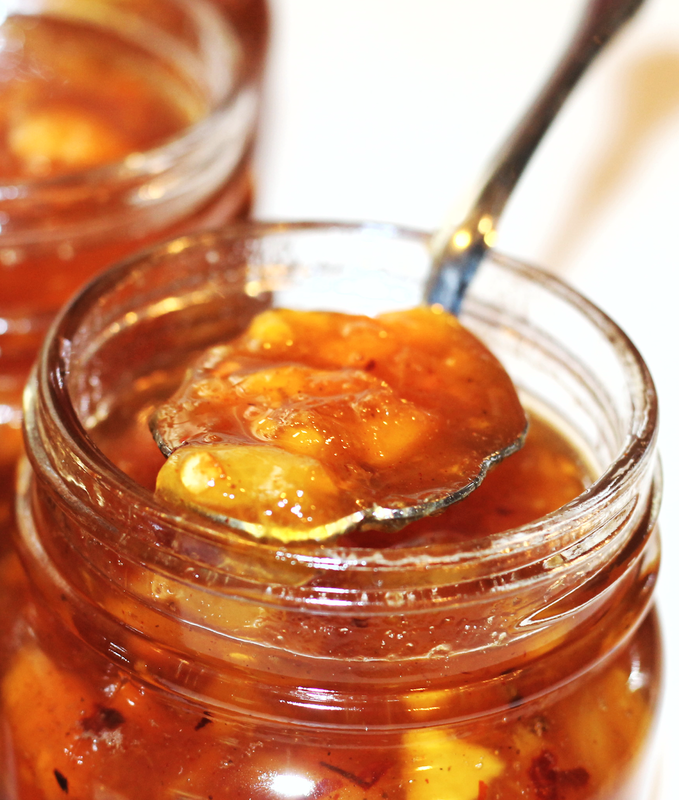 Remove from heat and fill prepared jars, leaving 1/4-inch head-space. Process half-pint or pint jars 10 minutes in boiling water bath or steam canner. Remove jars and allow to cool on a kitchen towel on your counter top 24 hours. Jars are sealed when button on top of lid is fully depressed and won't move up and down. 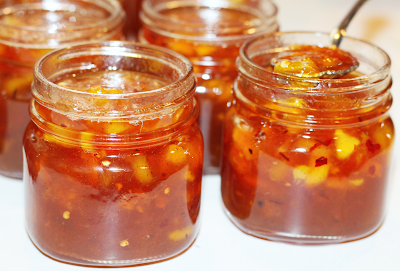 Recipe notes - This jam is mildly spicy. It has a very nice slow heat finish, but if you want more heat, you can taste test this before canning, and add more spice rub, diced habanero peppers or red pepper flakes.